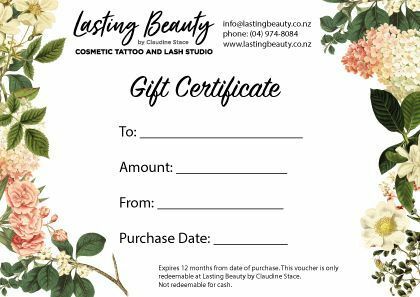 Wellington Cosmetic Permanent Makeup – Gift Voucher: Wellington Permanent Makeup: Lasting Beauty Cosmetic Tattoo Wellington by Claudine Stace. Wellington Lash Studio Permanent Makeup, Wellington Microblading, and Medical Tattoo work. Lower Hutt, Wellington. Treat someone you care about!! including Post Code, so that we can send them the Gift Voucher! Items below marked in bold and with a red star ( ) MUST be filled in. Value must be a dollar amount.